McMenamins/Facebook McMenamins Old Church Brewery — Wilsonville, Ore. The McMenamin brothers are known throughout the Pacific Northwest for converting historical buildings into brew pubs and concert venues that preserve the charming character of the original structure. McMenamin’s Old Church Brewery, about 18 miles outside of Portland, is no exception. At the turn of the 20th century, the church was at the center of a bustling trading village near the Willamette River. Today you can eat killer Cajun tots beneath its heavy wooden pillars and crossbeams. The brewery itself is located in what was once the church’s nursery, and specializes in sours and barrel-aged nectars. Taft's Ale House Taft’s Ale House — Cincinnati. Cincinnati’s own William Howard Taft was the 27th President of the United States, and is the iconic inspiration for Taft’s Ale House, which is nestled within an 165-year-old church in the historic Over-the-Rhine neighborhood. Those who enter through the thick double doors will be struck by the soaring ceilings, grand chandeliers, and giant metal fermenters which tower behind the bar like the pipes of a cathedral organ. In addition to a vast and frequently rotating tap list, Taft’s specialty is their tri-tip steak, so be sure to complement your libations with a juicy French dip. St. Joseph's/Facebook St. Joseph Brewery & Public House — Indianapolis. This Gothic cathedral built in 1879 by the Catholic Archdiocese of Indianapolis now holds St. Joseph Brewery & Public House. Newly opened in 2015, under the vaulted arches of this former house of worship you can order piping hot poutine and sample brews with faith-based names like Prophecy Porter, Confessional IPA and Altared Brown Ale. Church Brew Works/Facebook The Church Brew Works - Pittsburgh. 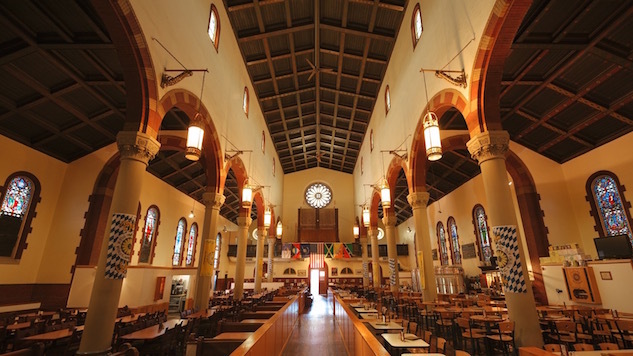 “And on the eighth day…man created beer,” is the slogan of this award-winning brewery, cloistered within an 112-year-old Roman Catholic church. Open since 1996, The Church Brew Works in Pittsburgh pioneered the trend of beer-making in a renovated house of prayer. Of course, worship of a different form takes place today, where a plate of rattlesnake-stuffed pierogies and a pint of Pious Monk Dunkel are practically divine. Urban Artifact/Facebook Urban Artifact Brewing - Cincinnati. Yet another church-based beer company in Cincinnati (in addition to Taft’s Ale House), the taproom of Urban Artifact Brewing sits in the basement of the former St. Pius X church. In fact, the brewery’s unique watercolor-style logo depicts the structure’s circular stained-glass window. To retain the building’s original character, the owners reused maple slabs from the church’s gym floor as a tap list behind the bar, and installed 1930s-era lamps they found lying dormant in the garage. Specializing in tart and sour beers, all of Urban Artifact’s brews are “wild,” meaning they’re made with “locally caught wild yeast, bacteria, or mixed cultures of both.” The result: delicious, funky flavors in a sanctified space. Brewery Vivant/Facebook Brewery Vivant — Grand Rapids, Mich. Though not exactly a church, the pub portion of Brewery Vivant in Grand Rapids, Mich. resides in the chapel of a former funeral home. Following strict historic preservation standards, the owners took painstaking measures to make sure their renovations reflected the original look and feel of the space (including a beautiful stained-glass window behind the bar). Brewery Vivant is also the first LEED certified commercial microbrewery, made more impressive by the fact that the original building was constructed in 1915. The French phrase bon vivant translates to “the good life,” which not only represents the brewery’s philosophy, but also their affinity for beer styles common in the French-speaking Belgian countryside. 3rd turn Brewing 3rd Turn Brewing — Louisville, Ky. Though most recently a lodge for the Loyal Order of Moose, 3rd Turn Brewing—located just outside of Louisville, Ky.—occupies what was originally a small Methodist chapel built in the 1860s. In fact, the building was purportedly used to hide slaves traveling on the Underground Railroad. During the church’s renovation, the brewers even found original brick facades and stained-glass windows hiding behind the plaster walls. Oh, and one more thing: The space might be haunted. But with a beer in your hand and an angel on your shoulder, what’s to fear? Salt Springs/Facebook Salt Springs Brewery — Ann Arbor, Mich. The interior of Salt Springs Brewery in Saline, Mich. (outside of Ann Arbor), with shining wood surfaces and an antler chandelier, in some ways feels more like a hunting lodge than a former Methodist church built in 1899. Then again, with shafts of fading sunlight peering through stained-glass windows, and the dim glow of Edison bulbs in pendant lights dangling from the ceiling, perhaps the intimate feel of a Midnight Mass is a more accurate comparison. Literally break bread with a local mushroom flatbed, and wash it down with Whoatmeal Cherry Stout, made with Michigan’s own Balaton tart cherries, for dessert. Expatshaarlem.nl Jopenkerk — Haarlem, Netherlands. For those interested in a pilgrimage, Jopenkerk in Haarlem—outside of Amsterdam in the Netherlands—could be considered a beer lover’s Canterbury. Situated within the massive old Jacobskerk (kerk means “church” in Dutch), this beautiful brewery intermixes a modern feel with the building’s ancient history. Jopenkerk is dedicated to recreating traditional Haarlem beer styles (the city is rich in brewing history), such as the Koyt: a recipe from 1407 that used gruit—an herb mixture with sweet gale as its main ingredient—to improve flavor and extend shelf life. For beer connoisseurs traveling to Amsterdam, paying penance at Jopenkerk is a must. Any lush will tell you that it doesn’t take a chalice full of red wine on Sunday for drinking to be a religious experience. But thanks to a new trend, you can now drain your glass seven days a week in these sacred settings: Breweries across the country (and beyond) are renovating former churches, converting them into public houses. We’ve tracked down nine such locations where you can bow your head at the altar of beer.